The Silky Terrier, or "Silky," is an energetic, curious, happy, busy, self-assured and loving dog who bonds every strongly with his owner and family. He loves attention and craves your companionship, and he wants to go everywhere and do everything with you. He is not a dog you can leave alone, either inside or outside the house. When bored or ignored he becomes mischievous, and especially loves to dig up your yard! He is a spunky, high-energy dog who is affectionate but doesn't necessarily like to cuddle or be fussed over. He prefers to romp and play with you, and loves ball games and chances to run and play outdoors. He has a great deal of stamina, and needs brisk, daily walks. When outside, he should always be leashed or in a safely fenced area, as he has very strong chase instincts and will run away after small animals. He can also be aggressive toward other dogs, and occasionally suspicious toward strangers. He makes an excellent watchdog because he is alert, suspicious, and intensely protective of his family and territory, and has a very keen sense of hearing. He will warn you with loud, high-pitched barks when he hears or sees something unusual. He can bark too much--in fact he loves to bark!--and must be trained not to do this. He will be barky and standoffish with strangers at first, then after a short while grow comfortable with them. He loves to go out into the world and makes a very good traveling companion. He is easy to train and a quick learner, although he may occasionally be obstinate, and doesn't always obey you. He can be difficult to housebreak. He needs firm and patient training with lots of love, praise and rewards. He is not good with small pets; he is much better at catching rodents than living with them! He can live with a cat if he is raised with it as a puppy. He gets along well with older, well-behaved children, but may not do well with those who are too young and rough with him. He basically doesn't shed, and so would be a good pet if you are a clean-freak. 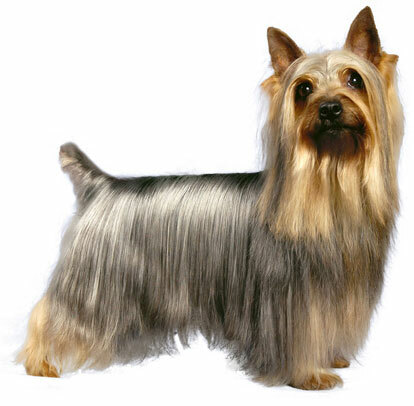 The Silky Terrier is 9 to 10 inches tall (to shoulders) and weighs 8 to 11 pounds. He has a long, straight, silky, glossy coat. His coat color can be black and tan, blue and tan, gray and tan, or silver and tan, or tri-colored. Pet coat: His coat only needs to be brushed occasionally, and clipped short every few months. Show coat: Brushed for 10 to 15 minutes daily to prevent matting and tangling, and trimmed every 6 weeks. The Silky Terrier was developed in Australia around the turn of the 20th century when native Australian terriers were crossed with Yorkshire Terriers in the hope of creating a beautiful, affectionate companion dog. A standard for the breed was first set in 1926, then refined in 1955, when the name "Australian Silky Terrier" was chosen for him. After World War II, soldiers who had been stationed in Australia brought the "Silky" home with them to America, and in 1955, the Silky Terrier Club of America was formed. His AKC popularity was 74th out of 157 breeds in 2007.